Last weekend, I was invited to an event that was wonderful. The Black Label Table – Underground Supper Club had their second evening of fine foods, fine people, fine wines, and all in a place that is not a restaurant. That was part of the ambience. It took place in a loft where the food was freshly prepared by two wonderful chefs with a penchant for the unique. The evenings meal was based on Momofüko in New York City. Living in San Diego makes Momofüko a little bit far to travel for a leisurly evenings meal. This was out of the park! 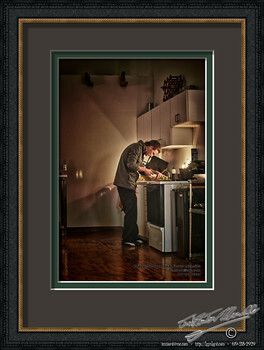 This entry was posted in Candles, Groups, Lovely Light, Man, Painterly, Portraits, Purchasable. Bookmark the permalink.